Editor’s note and some pre-game thoughts. 2As you hopefully noticed, I haven’t posted much this season. I’m finishing up my JD/MBA program while trying to find full-time employment. Unfortunately, this hasn’t left much time for posting, at least not enough to allow for the quality of analysis I expect (and you deserve). However, I consider this to be a short-term problem, and hope to have much more time to post next season. In order to keep things interesting here, I’ve added Patrick Causey as a contributor. His posts thus far have been tremendous, and we should all be excited to read his future work. If you would like to contribute, either on a one-off or regular basis, please email me at eaglesrewind@gmail.com. Dallas – A loss tonight puts Dallas at 2-6, with another week to go before Romo comes back. Moreover, they play 4 of their next 5 games on the road, and 5 of their last 8 games on the road. Their schedule includes games against Carolina (7-0), and at Green Bay (6-1). Basically, the Cowboys, even with Romo, are not going to win out. That puts them at no better than 9-7, and much more likely, 8-8 or worse. Giants – The Giants are 4-4, but the Eagles hold the tiebreaker over them right now by virtue of the head-to-head win and a Giants loss to Dallas in week 1. Here’s the key issue for New York: According to Football Outsiders, the Giants have faced the 28th hardest schedule thus far. Heading into this week, they have the 5th hardest schedule going forward. In other words, the Giants have a .500 record through the easy half of their schedule, so we shouldn’t expect anything better over the rest of the year (I expect worse). That puts the Giants, at best, at 8-8. Washington – Washington is 3-4, same as the Eagles. They’re currently getting killed by New England, so let’s just assume they’ll be at 3-5 soon enough. How do things look the rest of the way? Well, FiveThirtyEight’s ELO ratings have Washington as underdogs in EVERY game for the rest of the season. That could, of course, change in the future. But right now, it means Washington is very unlikely to string together a few wins. They’re remaining schedule includes: New Orleans (suddenly looking competent), @ Carolina (still undefeated and winning by 20 over GB right now), 2 games against Dallas w/ Romo, and week 16 in Philadelphia. Just 3 losses out of those games puts Washington at no better than 8-8, and that assumes they sweep the rest of their schedule (Buffalo, NYG, @ Chicago), which they won’t. They need 5 wins out of that stretch. Based purely on the ELO odds, the win expectation is 5.1 wins. If the Eagles win tonight, the remaining win expectation is at least 4.64 (so closer to 9 wins than 8), and likely higher assuming the ELO odds improve to account for an Eagles win. So that’s why tonight is important. Win, and Dallas is basically eliminated and the Eagles become the clear favorites, needing just 4 wins against a schedule that includes 3 games in which the team is a heavy favorite. Matt Cassell has been awful this year. Matt Cassel has also been bad for pretty much his entire career (save two seasons, the most recent of which was 5+ years ago). The Eagles defense should be able to completely shut the Dallas passing attack down. Darren McFadden is the Dallas “rushing attack”. The Dallas defense ranks 17th by DVOA, and 20th against the run. I really hope Ryan Mathews is healthy enough to play, but regardless, Chip needs to run the ball. The Jason Peters injury hurts, but it shouldn’t dissuade Chip from sticking with the run. This is not a game where they need to worry about the other team running away from them if they don’t get points up quickly. The Dallas Punt Coverage unit ranks 3rd worst in the league by Football Outsiders. Combine that with Matt Cassel and the Eagles defense, and we should be looking at a few big return opportunities for Darren Sproles. The Eagles have been so inconsistent that I’m hesitant to make any prediction. The Eagles SHOULD win this game. But the amount of uncertainty around the Eagles expected performance is so large right now there’s just no way to be confident about it. Chip – This is a huge game for Chip. As I explained above, the implications are enormous. He’s had a bye week to plan/prepare. Alonso and Kendricks are back healthy (I think). He’s going against Matt Cassel. Dallas has lost 5 straight games. In other words, there are absolutely no excuses for a poor performance. The Eagles are the better team talent-wise, and they’ve had more time to prepare and rest. If they don’t perform, it’s going to be really hard to blame anyone but Chip, especially because he’s now in charge of picking the players too. Sam Bradford – He’s been terrible. There’s no way around it, and if you’re defending him, just know that you’re doing so with absolutely no supporting evidence from his actual play. Yes, the WRs have also been bad, and the dropped passes make Sam’s job a lot harder. But remember that every WR drops some balls that should be caught. The questions isn’t how many drops, it’s how many drops ABOVE what we should expect. According to SportingCharts.com (full disclosure: I have no idea if this site is trustworthy or not), the Eagles have a drop rate of 6.6%. That’s 3rd highest in the league. The median drop rate is 3.9% (not using average because it would take too long to calculate right now and not make a meaningful difference). So…the TRUE drop rate we’re talking about is 2.7%. That’s how much worse the Eagles have been than average, according to this source. Bradford has 272 attempts. If we normalize the drop rate, that means Bradford should have 7-8 more completions than he does. Maybe a few more if we adjust for second-order effects as well (additional first downs). Regardless, still think drops are why Bradford has struggled? The only reason to have any hope is that Bradford is coming back from injury and is in a new system. He has a relatively long track record, which he is currently underperforming. That tells me that MAYBE, with a little more time to adjust/learn, he will get better. But frankly, “better” doesn’t get you very far when you’re looking at one of the worst starters in the league. He’s dead last in QBR, he’s 30th out of 33 qualifiers in Passer Rating. He has the 6th worst Interception Rate. He has the 3rd worst Yards per Attempt (and adjusted Yards per attempt). I hate to be so pessimistic, but it seems pretty clear to me that Bradford isn’t “the answer”, unless all you’re hoping for is league-average play. And in that case, he’s far too expensive, and will continue to be far too expensive after this year (my projection, perhaps the market value will be much different). The Defense – Not much to say here other than I told you so. Not that anyone was disagreeing, but I made it pretty clear in my preseason write-up that this defense could be a top 5 unit. Right now they rank #3 by FO. The Eagles are 3.5 point favorites on the road. Atlanta went 6-10 last year and ranked 20th in DVOA. The offense ranked 10th, while the defense ranked last in the league (also DVOA). The O/U is 55.5, which was the second highest on the board this week. Expect a lot of scoring. Has Jason Peters’ slowed at all? He’s still either the best or second best player on the roster, and the anchor of the OL. His level of play is vital. There’s no specific reason to expect him to be any worse than last year, but he’s entering his mid-30s, so it bears watching. Are the Guards serviceable? Barbre and Gardner don’t have to be great. They don’t even have to be good. But if the Eagles can’t get at least average/mediocre play from them, the running game won’t be nearly as potent as we’re all hoping or expecting. How will the Kendricks/Alonso/Ryans rotation shake out? Relatedly, how good is Demeco Ryans? This issue is going to evolve over a few weeks (at least), but we need to see how close to 100% Alonso is, and if Ryans is going to be a strict 1-2 down player. If Ryans is losing it and Alonso isn’t close to his pre-injury form, then what appeared to be a great strength for the team starts looking like a big hole. Has the pass defense improved? There are a lot of new names in the secondary, but it remains to be seen if there has been any improvement. Julio Jones is one of the best WRs in the league, so it’s a good early indicator for the defense. Last year the team ranked 18th in pass defense DVOA, and 7th in rush defense. In other words, an improvement in the pass defense could place the overall defense comfortably among the top 10 in the league. Meanwhile, the Falcons had the 8th best passing attack last year. So this matchup will play a large role in deciding the game. Sam Bradford should have plenty of time tonight. The Falcons registered the third worst adjusted sack rate last year (4.5%), and it seems like they’re betting on rookie Vic Beasley and FA signing Adrian Clayborn to fix things. Maybe they help a bit, but a drastic improvement is unlikely. That’s all I have time for. I’m feeling pretty good about this game, but it’s week one, so inherent uncertainty is high. Eagles win by a TD. Today’s the day we find out whether the Eagles are legitimate contenders or not. A win puts them in the driver’s seat for a top 2 seed in the playoffs and the bye that comes with it (hugely important). Also, a bye likely means avoiding the Packers until the NFC title game. On the other hand, if the Eagles get overwhelmed by the Seahawks, we’ll have a pretty good sign that the team isn’t quite ready to join the upper echelon of the conference (they’d have losses against GB, SEA, and SF). – The Eagles match up much better against the Seahawks than they did against the Packers. The Seahawks are not a strong passing team. They’re averaging just 192 passing yards per game, and while Russell Wilson has played very efficiently (94.7 rating, 15 TDs, 5 ints), the team is really powered by its defense and run game. In other words, the Seahawks don’t seem equipped to exploit the Eagles’ biggest weakness, the Corners and Safeties. Play-action will probably still be a problem, but there aren’t any premier WRs to worry about. – On defense, this game comes down to whether or not the D-Line can get off their blocks and put some hands on Marshawn Lynch. Lynch is one of the most difficult RBs in the league to tackle. He’s second in the league in Yards After Contact (Murray is first) and leads the league in Misses Tackles (both from PFF). That means the LBs need some help. If the D-Line can’t do anything to hold Lynch up, he’ll likely make the rest of the defense look bad. So Bennie Logan and Fletcher Cox, in particular, need to be at peak performance. – On offense, Mark Sanchez needs to play very intelligently. I’m worried. On the outside, the match-ups clearly favor the Seahawks. That’s not a huge problem for the Eagles though. Sanchez has preferred Jordan Matthews in the slot as a target, as well as his TEs. As I mentioned, I think the Eagles match up relatively well against Seattle. If Sanchez can keep the ball in the middle of the field, and doesn’t get aggressive on the outside or downfield, the Eagles can score. However, that game plan has a fairly predictable consequence. The Seahawks will compress their defense, meaning gains will be short. That leads to a lot of 3rd down plays, and the conversion rate of those plays might determine today’s outcome. For the season, the Eagles are converting 43.72% on third down. That ranks 10th in the league. However, that number has improved over the last 3 games (46+%), potentially due to the healthiest O-Line. That, plus Darren Sproles’ obvious hatred of 4th downs, leads me to believe the Eagles will be somewhat successful. – The Seahawks defense is drawing a lot of attention, allowing 6 points combined over two games will do that. For the season, Seattle is allowing just 18.4 points per game. However, the team has performed much better at home than on the road. On the road, Seattle has allowed 30 (SD), 17 (WAS), 28 (STL), 9 (CAR), 24 (KC), and 3 (SF). That’s good, but not spectacular, especially when you factor in the strength of those offenses. More encouraging, Seattle is scoring just 21 points per game on the road. The Eagles, meanwhile, haven’t scored fewer than 27 points in a home game this year and are averaging 36.7 ppg. That’s a huge differential, but it holds the key to my optimism for today. Home/Road splits are really hard to properly account for, but if they hold any informational value, things look good for the Eagles. Full odds breakdown is below, I’ve got the Eagles winning a very close game. Note that the line has shifted since I did the write-up and the Eagles are now 1 point underdogs. Note: The line opened at Eagles -1.5. Won the line, lost the O/U. I had the Eagles performance pegged fairly well, though I have to admit Mark Sanchez exceeded my expectations. The Cowboys, though, were much worse than I had projected. That’s really good for the Eagles, but makes hitting the over tough. Anyway, I’m now sitting right on .500 for the season, meaning I’m within range of my target >.550, but need to finish strong to hit it. The readers, meanwhile, are having a great season, riding the market’s underestimation of the Eagles for the first half of the season. Last week’s game was huge for the division. This week’s game is huge for the conference. 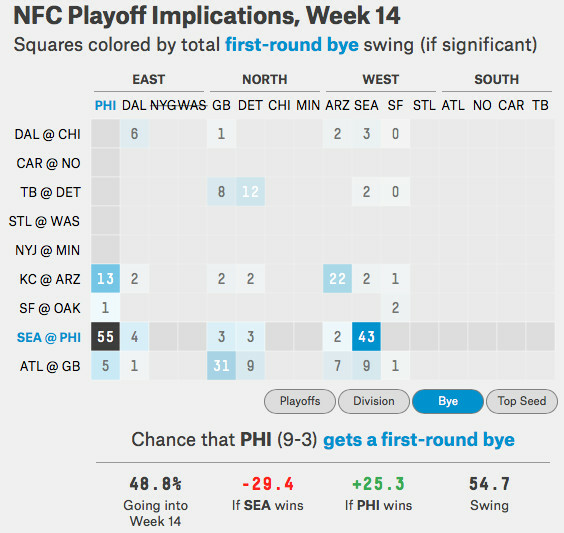 Below is a screen grab from FiveThirtyEight.com’s interactive playoff odds graphic. As you can see, a win puts the Eagles at close to 75% for a 1st round bye in the playoffs, while a loss drops them to below 20%. With so much at stake, and some extra time to prepare, I think we’ll see peak Chip Kelly. The question, of course, is whether or not that’s good enough to beat the Seahawks. The Seahawks’ bandwagon is growing quickly, for obvious reasons. The defending Champs have won 5 of their last 6 games and have held two division opponents and playoff contenders to a combined 6 points over the past two weeks. Before we get to the breakdown, I do want to point out that wins over Arizona and San Francisco aren’t quite as impressive as they sound. Arizona, a team many were skeptical about during its 9-1 start to the season, is falling apart and might actually miss the playoffs (tough schedule coming up). San Francisco is a good team, but Colin Kaepernick has struggled. The team’s offense is averaging just 19.2 ppg and its offense ranks 18th in the league by DVOA. That’s a long way of saying the Seahawks’ defensive performance in these games has been impressive, but far from the otherworldly level you might have guessed based on what national writers are saying this week. The Eagles STs ranks 1st overall (8.8%), while the Seahawks rank 18th (0.9%). By DVOA, this is a very close matchup. More importantly, the numbers clearly indicate the Seattle is a good team, not a great one. By weighted DVOA, which overweights recent performance to try to gauge a team’s current strength, the Eagles (5th) are actually better than the Seahawks (7th). The only unit that really sticks out above is the Eagles’ offense. Really surprising given what we believed heading into the season, but its the offense that’s holding this team back right now. Arizona: Eagles lost by 4 on the road. Seahawks won at home by 16. (Seahawks by 17). Giants: Eagles won by 27 at home. Seahawks won at home by 21. (Eagles by 6). 49ers: Eagles lost by 5 on the road. Seahawks won by 16 on the road. (Hawks by 11). Dallas: Eagles won by 23 on the road. Seahawks lost by 3 at home. (Eagles by 29). Carolina: Eagles won by 24 at home. Seahawks won by 4 on the road. (Eagles by 17). St. Louis: Eagles won by 6 at home. Seahawks lost on the road by 2. (Eagles by 5). Green Bay: Eagles lost on the road by 33. Seahawks won at home by 20. (Hawks by 50…ouch). That’s a 4-4 split if we just go by the advantages, but if we adjust for home field and add up the advantages, we get a Seattle advantage of 21 points. Across 8 games that’s not that bad, especially when you consider the Seahawks entire advantage is driven by the GB comp. Seattle played GB in week 1 while the Eagles got them in week 11. That’s not an excuse for the Eagles, but it means the comp is less valuable informationally than if the games had been played close together. Overall the advantage points to the Seahawks, but it’s narrow. Of the Eagles defensive opponents this year, the Cardinals are most comparable (one spot better than SEA by DVOA). Against them, on the road, the Eagles scored 20 points. Against the second best defense by DVOA, San Francisco, the Eagles scored 21, also on the road. Of Seattle’s opponents, the Eagles offense ranks most similarly to to San Francisco (Eagles are better by 3 spots). Against the 49ers, on the road at home, the Seahawks allowed just 3 points. On the road, however, the Seahawks allowed 24 points against KC (4 spots better than Eagles by DVOA). For the season, the Eagles are averaging 31.2 ppg, while the Seahawks are allowing 18.4 ppg. The Eagles have yet to score fewer than 20 points this season, and at home they’ve scored at least 27 in every game. Combining the factors above, I’m setting the Eagles projection at 24-25 points. Of the Seahawks defensive opponents this year, the Eagles rank closest to Arizona (Cardinals are better by 3 spots). Against them, at home, the Seahawks scored 19 points. The Eagles defense ranks 2 spots ahead of St. Louis (though the DVOA gap is large). Against, the Rams on the road, the Seahawks scored 26 points. The Seahawks’ offense ranks 7th by DVOA. That’s one spot above Dallas. Against the Cowboys, on the road, the Eagles allowed 10 points. Against Indianapolis, which ranks 13th (next closest), the Eagles allowed 27 points on the road. Together, that all points to a range of 20-24 points. Overall, the Eagles are allowing an average of 23.8 ppg, while the Seahawks are scoring 24.8 ppg. Once you factor in the home/road splits, that’s right in line with our range. That gives us 20-24 points for the Seahawks. On Special Teams, the Eagles have a big advantage, especially in the punt return vs. punt team matchup. Since we expect Seattle to punt a lot, that could end up meaning a lot. Given that, and the general disparity in STs DVOA, I’m giving the Eagles another 1 point to move the top of their range to 26 points. That gives us a final score projection of Eagles 24-26, Seattle 20-24. If we take the midpoints, it gives us a base-case of Eagles 25-Seattle 22. That’s a very unlikely final score, but we’re just looking for a direction signal. Since the line is even, we get a narrow signal to take the Eagles. Not much room here, but that’s the pick. On the O/U, we’ve got a range of 44-50 points. The line is set at 48.5, so this is a tough call. Eagles games have averaged 55 ppg this year, but Seattle’s have averaged just 43.4 ppg. I like the way the Eagles defense matches up against Seattle, so I’m going against our Over rule and taking the under 48.5. More generally, the Seahawks don’t seem positioned to take advantage of the Eagles’ weakness (defensive backfield). With the D-Line playing so well, I like our chances to force punts and hold Seattle to FGs. Seattle’s defensive strength on the outside is bad for Maclin/Cooper/Huff, but since Sanchez targets Matthews a lot anyway, that strength is mitigated. If Sanchez can keep his focus on low-risk throws to the middle of the field, leveraging Matthews, Celek, and Ertz, I like the Eagles to win a close game. If he tries to push the ball downfield or to the sidelines, though, we could see a number of turnovers… Lastly, if the Eagles do that, expect Seattle to load the box, which will lead to a number of 3rd and 1-5 yard situations. If that happens, Darren Sproles once again becomes the key to the game. Odds breakdown is below. Shot version: 80% of the public is betting the Packers, the line is up to 6 on Bovada. I think that’s too high, and there’s potentially a huge recency bias here. The Packers look great (though the Eagles played very well against the Panthers), but their best win was against the Dolphins. Meanwhile, they’ve lost games against the Lions, Seahawks, and Saints. Note that all of those games were on the road, but they also lost them by large margins (details below). Overall, Rodgers/Nelson against this secondary scares me, but their far from a “great” team, at least thus far. – The key to beating Aaron Rodgers is pressure. That sounds like a really obvious statement, and it is. However, Rodgers is the best QB EVER at avoiding interceptions. He’s got an INT rate of just 1.1% this year, and a career rate of just 1.7%. That’s amazing, as are most of his stats. However, when it comes to sacks, Rodgers is much more ordinary. He’s taking them this season at a rate of 6.7%, and his career rate is 7.2%. He uses his legs and athleticism to keep plays alive, but he’s also prone to holding the ball to long and taking sacks. Even more enticing is his propensity to fumble. He’s done so 4 times this year, and 46 times in his career. The Packers are going to score today, but the Eagles can mitigate the damage if they can grab a Rodgers fumble, or get a couple of timely sacks to force short drives. – Mark Sanchez will be a point of focus for everyone, but I’ve got a slightly different take. Whereas last week (and pretty much every game for the past month) I said the key was avoiding turnovers against an inferior team, this week we have a different situation. The Eagles will likely need to score 3-4 offensive TDs to win this game. That means taking a few chances. So…the key for Sanchez is NOT avoiding INTs (though that would be awesome). The key is the ratio of big plays to INTs. I’ll gladly accept an interception if it means he’s hit on a few high-reward balls downfield. This just doesn’t seem like the type of game you can win by kicking a bunch of FGs. – Speaking of FGs, Cody Parkey has been amazing. He’s 16 of 17 overall, and has hit all 3 FGs from 50+ yards. Just as important, he’s kicking touchbacks at a rate of 62.50%. For comparison, last year the Eagles (Alex Henery) had a rate of just 40%. I bring this up because today will be the toughest conditions Parkey has faced. It probably won’t crack 30 degrees today, and there’s a 20% chance of precipitation (i.e. snow). That definitely takes some distance off of his kicks, the question is how much. What we see today will go a long way towards informing what we can expect from him in the playoffs, especially if the Eagles get a home game(s). – Mychael Kendricks and Fletcher Cox look really good. Today they’ll be challenged more than they have been in a long time. I’m optimistic, but there’s certainly a risk that these guys, and the defense as a whole, have benefited from playing a lot of very weak offenses. While it’s a great evaluation of everyone on defense, I’ve made it clear that these are the most important players. As long as they’re playing well, the Eagles long-term future looks good. More below, but today’s game is a pretty good one from a fan’s perspective. The Eagles are 6 point underdogs, which means they’ve only got about a 35% chance of winning. The Packers are covered in hype and the Eagles are starting Mark Sanchez on the road. In other words, this is a “mostly upside” game. A win is huge, and a loss isn’t (Wild Card odds would take a big hit, but division still looks very good). Additionally, I think the public has pushed this line too far. Expect a close game, hopefully this time the Eagles come away with the win. Note: This line opened at Packers -4.5. 1.5 points is a big shift, especially with the Eagles coming off a really impressive win. It looks like the Packers hype-train is just about full, which means we should look very closely for signs the team might be overrated. That’s more like it. 4-0 over the last two weeks, though my projection for this game wasn’t nearly as close as last week’s. Of course, it was pretty clear going into the game that the Eagles were a much better team, the only question was how large the win would be. Sanchez played a much better game than I expected, and the Eagles ST scored another TD. All in all a great win. As a reminder, winning by very large margins over bad teams is a really good indicator of team quality. With big wins over the Jaguars, Giants, and Panthers, the Eagles are looking really good on that front. Well…it had to happen sometime. The Eagles defense gets its toughest test, by far, since week 2 against the Colts. Aaron Rodgers is arguably the best QB in the league (and on his way to one of the greatest careers ever, as I’ve discussed before), and the Eagles are still starting Nate Allen on defense. Before we get to the DVOA numbers and breakdowns, let’s take a quick look at what the Packers have done so far. The Packers are 6-3 on the year, averaging 30.8 ppg and allowing 22.8 ppg. The team’s wins have come against the Jets, Bears, Vikings, Dolphins, Panthers, and Bears (again). On the other hand, the Packers have lost games against the Seahawks, Lions, and Saints. The only win that looks somewhat impressive is against Miami (6-4), a road game the Packers won by a field goal. When we take a look at the losses, though, things look even better for the Eagles. Although all three losses were on the road, the margins of 20, 12, and 21 points should dispel any notion that the Packers are a great team. As everyone here knows, the Eagles largest lost was just 5 points, on the road against the 49ers. On STs, the Eagles, obviously, are in first overall. The Packers have a STs DVOA of 0, placing them 15th in the league. As I mentioned, this will likely be the best offense the Eagles face all year. Much will depend upon the defense’s ability to prevent big plays. The only opponent in common is the Panthers. The Eagles beat them last week, at home, by a score of 45-21. The Packers also beat the Panthers at home, by a score of 38-17. Those results are really close, so while that doesn’t help us in picking a winner overall, it does suggest these two teams are similarly skilled, which certainly calls into question the size of the spread. The Eagles have not played an offense as good as the Packers. Green Bay ranks second in the league, just behind Denver. The closest the Eagles have seen was in week 2 against the Colts. In that game, the Eagles allowed 27 points. On the season, the Eagles are allowing an average of 22 ppg. Obviously, we should expect the Packers to exceed that by a fair amount. Among Packers opponents, the Eagles defense ranks most similarly to Seattle (just better) and a bit worse than Miami. Against those teams, the Packers scored 16 and 27 points. Both of those games were on the road. Combining it all, I’m setting the Packers scoring expectation at 27-30 points. That Seattle data point is a tough one to incorporate, but given the agreement among the others, I’m assigning it very little weight. The Packers are averaging 30.8 points per game, but have played a number of good defenses. Therefore, expecting them to score just below their average seems reasonable. The Packers defense ranks most similarly (a little bit better) to Jacksonville and Houston. Against those teams, the Eagles scored 34 and 31 points, though Jacksonville was a home game. On the flip side, among Packers opponents, the Eagles offense ranks most similarly to Chicago (a little worse) and Miami (just better than Chicago). Against the Bears, the Packers allowed just 17 (road) and 14 (home) points. Against the Dolphins, the Packers allowed 24 points (road). That’s bad for the Eagles. In fact, the Packers have played 4 games at home this season and in those games have only allowed 20+ points once (Jets scored 24). However, the Eagles haven’t scored less than 20 points all season. Putting it all together, that puts us in the 21-25 point range. However, we haven’t accounted for STs. While normally not a big factor, the Eagles unit has been so good, especially in the return game, that its foolish not to adjust. Given that the Packers are mediocre in Punting DVOA and relatively bad in Kicking DVOA, I’m bumping the Eagles offense a full 2 points. That moves us to 23-27 points for the Eagles. If we combine our projections, we get a range of Pick’em to Packers +7. With the line at Packers -6, it’s pretty clear we should take the Eagles with the points. On the over/under side, or combined projections give us a range of 50 – 57 points. The line is 55. Three of my four losses on the over/under this season came from taking the under. In fact, I made a point of saying if it’s anywhere close we should take the over. However, 55 points is a really high line, and our range says there’s more value in the under. So that’s the play. Wrapping up, this looks like a tough game for the Eagles, but 6 points is too large a line. The Packers aren’t as good as they seemed against the Bears, and might not have beaten a good team yet (depending on your evaluation of Miami). Given the movement in the line towards the Packers, I think there’s a really good chance the team is being overrated at the moment. Look for a close game, in which case a single play might determine the final outcome. Running way behind schedule (only 45 minutes to game time), so I’ll keep this brief. Odds breakdown is below, but short version is: the line looks dead-on. That makes betting difficult, but it means the Eagles really should win this game. – This is basic stuff by now, but as a big favorite, the Eagles should look for a low-variance strategy. That means relatively conservative play-calling, a special focus on turnover avoidance, and backing off the blitzes a bit. All of that is relative, of course, 4th and 1 is still a go for it situation in most situations. – The turnover avoidance point from above is the one that worries me. The Panthers are averaging less than 20 points per game. If they score more than that, it will likely be because the Eagles gave them great field position (or points) with turnovers. Unfortunately, Mark Sanchez is extremely turnover-prone. It’s certainly possible (perhaps probable), that Chip Kelly’s system will help Sanchez with easier reads/throws. However, we can’t ignore Sanchez’s history (3.8% int rate, and 43 fumbles in 63 games). This is a game that calls for pure “caretaker” play from the QB, and I’m not that confident in Sanchez’s ability to play that role. – Evan Mathis is back, which means the Eagles are as close to being 100% healthy on the O-Line as they have been all year. Herremans, of course, is gone, but I’m not sure there’s much of a drop-off in play from him to Tobin. The upshot, of course, is that we can finally see if the Eagles rushing problems (and play-calling change from last year) were due to the line play, an actual Shady injury, or something else. With Sanchez in the game, we should get plenty of opportunities to watch and evaluate the run game. Kelce looked rusty last week, particularly with his snaps, but he also looked to have all of his athleticism back. With the Kelce/Mathis combo back, look for a lot more action in the screen game. There’s just no way to replicate the ability of those guys to get downfield quickly enough to stay in front of the RB at close to full speed. – Also keep an eye out for Zack Ertz. This is completely speculative, but my guess is that Celek’s blocking was particularly valuable while the OL was banged up. With those guys healthy again, Chip might be more willing to trade Celek’s blocking ability for Ertz’s offensive ability. – Mychael Kendricks’ looked great last week. For the long-term, he’s the most important player to watch tonight. If he can consistently play as well as he did against the Texans, the Eagles have found themselves a major defensive piece for the foreseeable future. Combined with Cox, that would form a really strong foundation on the defensive side of the ball. Let’s see if he covers Greg Olsen at all tonight. Olsen’s not great, but he’s a major part of the Panthers’ passing attack (along with Kelvin Benjamin). It’ll be a good test for whoever ends up covering him, but I’m most curious to see if Kendricks’ coverage skills have evolved. On the other hand, the Panthers’ rush dominant offense should give him plenty of opportunities to make plays. Last season he was over-aggressive at times, leading to some missed tackles and poor angles. Cleaning that up is perhaps his biggest “to do” if he’s to fulfill his potential. That’s all for now, see the breakdown below for more. Nailed the score range for the second week in a row (I also pegged the Eagles for 27 points the game before that). I had the Eagles at 30-32 points and the Texans at 20-23. Final score was 31-21. Fortunately this time the line was off by enough to give us an easy win. Let’s see if we can put a streak together here. This is a BIG line. Especially given that the Eagles are starting a backup QB and just lost their starting MLB and defensive play-caller. So what gives? Those teams are a combined 25-17. Of course, Carolina has lost those games by margins of 18, 28, 21, 4, and 18. Basically, they’ve shown no indication they belong among the top half of the league. Let’s see what DVOA has to say. The Eagles are still 1st in STs DVOA, the Panthers rank 18th. As is clear from the numbers above, the Eagles are the MUCH better team by DVOA. I’m not that excited to see Mark Sanchez start, but since he has to, this is a pretty good time to do it. Opponent QBs have a rating of 97.4 against the Panthers this season. Opponents in common- Unfortunately, the Eagles have not played any of the same teams as the Panthers. That means we’re missing a valuable piece of information regarding relative strength. Out of the teams the Eagles have played, the Panthers defense ranks a little below Washington and the Giants, and a little above St. Louis. Against those teams, the Eagles scored 37, 27, and 34 points. That puts us around 32 points. The Eagles are averaging 29.1 ppg thus far, so scoring a FG more than that against a bad defense isn’t exactly a stretch. Mark Sanchez worries me a bit, and not necessarily because I don’t think he can play well. Regardless of your feelings about him, there’s no question he presents a major risk factor. So 32 points seems reasonable, but with a backup QB, it’s really hard to have a lot of confidence in the projection. Of the Panthers’ opponents, the Eagles rank a bit below the Bengals. Against them, the Panthers allowed 37 points. In fact, the Panthers have managed to hold their opponents below 24 points just 3 times this year: against the Bucs and Lions in the first two weeks, and against the Seahawks two weeks ago. Overall, the Panthers are allowing an average of 26.2 ppg. In other words, the Eagles should be able to score a fair amount. However, I don’t trust them to put up close to a full TD more than the Panthers are allowing on average (to a lot of really good teams). Given that, I’m dialing the Eagles expectation back to 28 points. From the other side, the Panthers offense ranks most similarly to the Giants, against whom the Eagles allowed 0 points. The next closest opponents by DVOA are Washington (Carolina is a bit worse) and San Francisco and Arizona (Carolina is a bit better). Against those teams, the Eagles allowed 34, 26, and 24 points. That puts us at 27-28 points. However, the Panthers are averaging just 19.7 points per game overall. The Eagles have a good defense. Basically, I think DVOA is overrating the Panthers offense here. If we view it from the other perspective, the Eagles defense ranks most similarly to Baltimore (a bit better), and is also close to Seattle (a little worse). Against Baltimore, the panthers scored just 10 points. Against Seattle, they scored just 9. Now we have a problem. Our two estimates are completely different. On average, the Eagles are allowing 22.1 ppg, so I’m inclined to skew closer to that amount. All told, I’m setting the Panthers expected output at 20-21 points. That gives us a final projection of Eagles 28, Panthers 20-21. The line is 7, so we’re very close. On balance, the Eagles look like the slightly better pick, but remember what I said about Sanchez. Him playing puts a lot of additional expected variance in the game. In other words, be careful with this one. Even more bad news: the Over/Under is 48, meaning we’re right on target there as well. The Eagles are hitting the over pretty consistently, so if I have to pick a side that’s what I’m going with. Just know there’s not nearly as much opportunity in this game as there was last week.